James Welburn was born circa 1853/1854 in Blackwater, a Baltimore Hundred farming community in Sussex County, Delaware. He is the 3rd son of Mary & George Welburn known to survive to adulthood and is presumed to be a twin of his sister Martha. The Welburns and many other residents of Blackwater were overlooked during the 1860 Federal Census. James makes his first and only confirmed public records appearance in the 1870 Census at the age of 17. At the time, he is a laborer for Roxana farmer Jerry Hudson. James does not appear the Baltimore Hundred tax records in the 1870s, nor is he recorded in the 1880 Federal Census. It is presumed for now that James Welburn died between 1870 and 1879 without a wife or children. 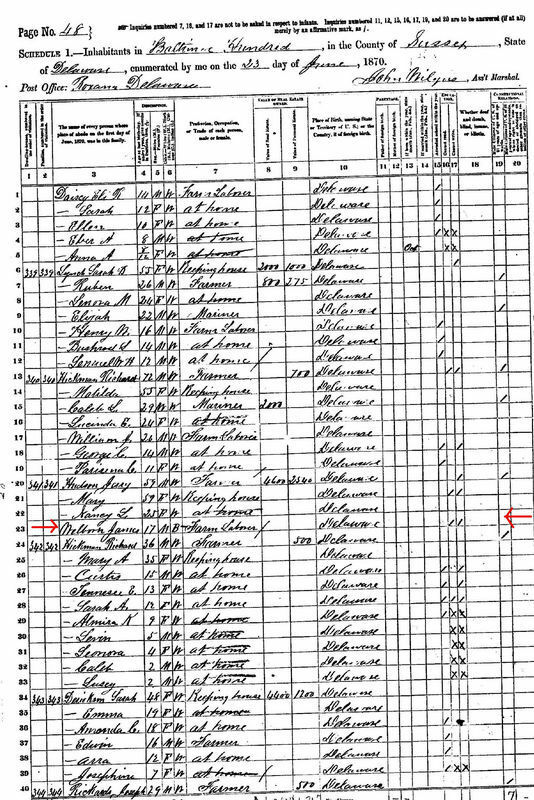 However, there is a "James Wilborn" of the approximate age residing in Westchester County, NY in the 1905 State Census. Unfortunately his state of birth is not recorded, so he cannot be positively identified as our James Welburn at this time.